Are your kids home alone? Per a survey of working parents, one in five children ages 6 to 12 is regularly left without adult supervision after school. For many families, this is the best solution. Of course, children must have some basic skills, a level of maturity, and their parent’s trust to be left at home alone. Smart home technology now provided by Sentry Security Solutions is helping to put working parents’ most common worries to rest and making it safer for kids to stay at home alone. How does Smart Home technology help working parents? Welcome to the life of the modern latchkey kids. 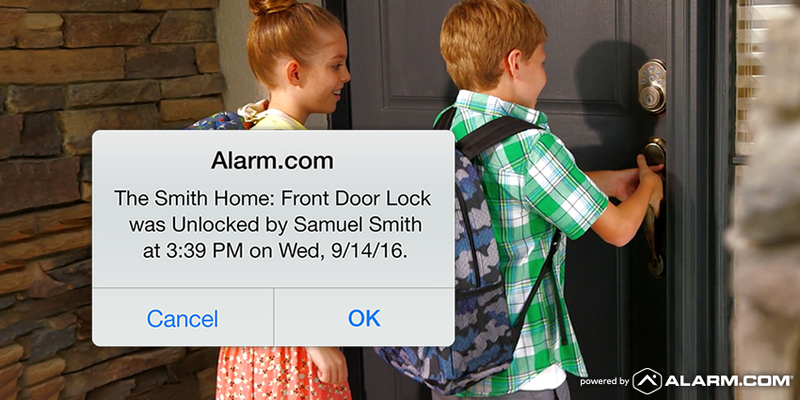 Thanks to smart home technology, latchkey kids no longer have to carry a key around their neck. Gone are the fears of your child losing their key on the playground and being locked out of the house until you come home after work. Smart locks have the ability to be controlled by the parent from afar. If you know your child always walks in at 3:15 you can set the door to unlock then. Or if they are going to be late with an after-school activity you can unlock it from your smartphone at the new designated time. Children can also have their own “digital” key, which means they input a code into the lock to get into the house. A great safety feature of this technology is you can lock the door directly from an app on your iPhone or Android smartphone. No more sitting in a meeting worrying if your child locked the door after they came home. Another great safety feature is you can monitor who comes in and out 24/7 with an activity log on your smartphone. Once a child is safely at home, you can arm or disarm the alarm system from your phone or computer. Managing the home environment is easy too. With a smart home, you can set specific lights to come on at 3:15 and for the air or heat to kick in a few minutes before your child comes home, making the house comfortable for them. Now that your child is safe inside, you can also monitor what he/she does with internal IP video feeds. With a click on your computer, tablet, or smartphone, you can see what is going on in different areas of the house. Is homework being done or are video games being played? Are healthy snacks being chosen or junk food? You can easily check-in and see. Children appreciate rules and routine so this kind of parental involvement, even while you are at work can add needed structure to their day. A smart house is equipped with the alarm system also to monitor for fire or carbon monoxide. If either were detected an alert would be sent to your phone as well as the call center. Another great safety feature that is easy to incorporate into a smart home is a video doorbell like the Skybell The doorbell rings at 4 o’clock. Both you and your child on separate devices can check and see who is there. Is it your son’s best friend asking him to come over and play? An important package that needs signing? Or a dreaded door-to-door salesman? With a video doorbell, you decide if you want your kid to get the door. Even better, you can “answer” the door from afar. Using your smartphone, you can speak through the Skybell video doorbell and tell the salesman you are not interested. They will never know your child is in there alone since an adult just “answered” the doorbell. Smart homes are making after school safer for kids today. Call us or fill out this form to get in touch with us about smart home technology from Sentry Security Solutions, a leader in home security, professional monitoring, and smart technology. Whether it’s a snow day home from school, an unexpected business appointment, or a childcare arrangement that fell through, situations are likely to arise where you feel you have little choice but to leave your child home alone. Greetings! Really helpful advice on this post! It truly is the small changes that make the biggest changes. Hi there! This post could not be written any better! Reading through this post reminds me of my previous room mate! He consistently kept talking about this. I will forward this post to him. Fairly confident he will have a great read.